One of the main problems that causes saw blade back cracks is when you have your machine?s guide arms spread to far apart, so be sure to keep them properly spread. Always make sure the guide to wheel alignment is correct and that the guides are not too tight. If the top guide is missing, then back cracking is a definite risk to your operation. 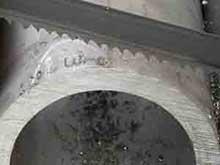 If you observe the band saw blade rubbing on the wheel flange, than that can be a sign that back cracks had occurred. Making sure your top guide doesn?t have a notch on it can help prevent back crack. 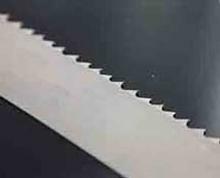 Additionally, if the bend of the saw is too straight than back crack may occur. Guide to Wheel alignment is bad.